Baby, it’s (getting) cold(er) outside. So, here are a couple of moisturisers you might like to add to your bathroom cabinet to keep your skin summer soft all winter. 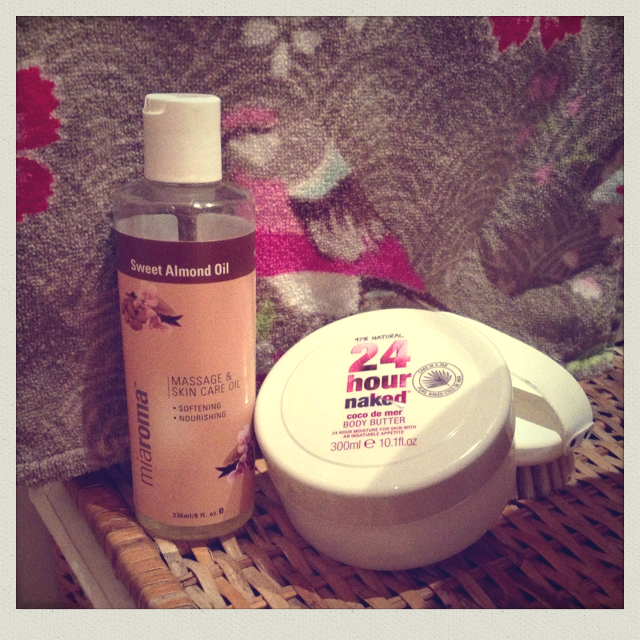 First on the list is almond oil. A good bathroom staple for all the family — it’s even suitable for newborn babies — I’ve been totally wowed by how soft it’s left my skin, especially my elbows which were going though some nasty scaly phase before I started using it. It’s speedy to apply and because it’s a vegetable oil it doesn’t sit on the skin like some oils (Bio Oil stains on clothes, anyone?). It’s unscented, so it won’t clash with your perfume, and you can combine it with your favourite essential oil for a bit of added luxe (it’s also a great massage oil). I’ve even used it to remove make-up and it makes a good pre-shampoo hair treatment (just rub into hair and leave for 30 minutes before washing out). A fabulous all-rounder. Natural credentials: Pure almond oil with added vitamin E.
Available from: Holland & Barrett, both in-store and online. If you’re not a fan of oils then try Naked’s Coco de Mer Body Butter. It combines coconut oil, shea butter and passion flower oil to create a rich, buttery cream that smells sensational. It glides on and smooths even really dry skin instantly. A fantastic budget body cream. Naked 24 Hour Coco de Mer Body Butter: £5.45 for 300ml online at Boots or £4.99 for 300ml on the Naked website. Natural credentials: Claims to be 97% natural and is free from parabens, petrochemicals and sulphates. Available from: Online only from Boots and Naked’s own website.